"It is not what we carry with us, but what we let go that defines us." The focus for this week (Week 3) is on RELEASING. Releasing can take many forms: letting go of something that is not working, moving on from a relationship that no longer feeds us, forgiving someone who has hurt us, detoxifying our bodies and minds from that which we consume that somehow damages us, etc. One of my favorite tools for releasing is The Violet Flame Meditation. If you are a long-time reader you have almost surely heard me talk about this before. It is one of my favorite tools for forgiveness and is also great for RELEASING. In fact, I have a whole page on my website devoted to it. If you would like to learn more about this meditation, I encourage you to check it out. Start by taking three deep breaths. 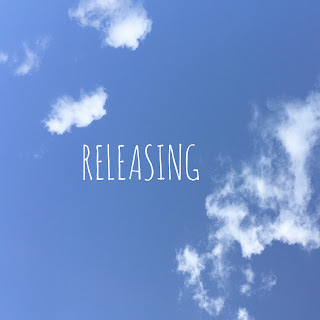 Bring to mind the thing that you would like to release. Imagine that you are holding three pieces of paper in your hands. In your mind, write on these pieces of paper that which you would like to release. Set them aside. Using flat stones, build an imaginary base on which to start a fire. Start with one stone in the middle and build out, one stone at a time in a circular pattern, creating a circle of stones about three feet in diameter. Now imagine crumpling up each of the three pieces of paper on which you "wrote" the thing you would like to release, and place the three balls of paper in the center of the stone base. In your mind gather a handful of twigs, three medium-sized sticks, and three small logs. Place the twigs on top of the balls of paper. Then take the three sticks and prop them up on the base, over the twigs, in the form of a triangle or a tepee. Take the three small logs and position them on the outside of the three sticks in the same formation. Ask Saint Germain to come forward and hand you some matches. Take the matches and offer him your thanks. Strike a match and light the fire with the violet flame. Watch as it burns away all of your stress, your attachments, grievances, and hurts. As the fire builds in your mind, step into the fire and allow it to burn away any negative energy you are holding in your body or in your aura. Release all negative emotions, negative thought patterns, and negative energies past and present that are currently effecting you. Stand in the fire until you feel clean. When you feel complete, step out of the fire and give thanks to God and St Germain for this meditation. If you have any questions about the meditation (or anything else), feel free to comment below and I will respond. Or find me on my Facebook community, Being & Becoming. Don't hesitate to contact me - I love questions! And don't forget to enter your email address in the box to your right -------> to receive posts via email. This is especially nice for the inspirational quotes that will be posted throughout this week. These daily reminders to focus on RELEASING can really help. Labels: Albert Einstein, Intuition, KNOWING, Write Your Life! than any other person can be." The theme for week two is KNOWING. This week is all about INTUITION and how to tap into yours. Making time for meditation and just BEING is a big part of that so I hope you will continue your work from last week and make time every day this week to just BE. If you would like to start to play with your intuition, try out the exercise below. For this exercise you will need your journal (or a couple of sheets of paper), a pen and a comfortable place to sit and write. Ground yourself by placing your feet firmly on the floor. Sit up straight, resting your torso and head evenly on your sitting bones. Take another deep breath. Bring to mind the biggest challenge or problem in your life right now. What are you struggling with? What question seemingly has no answer? Write a brief description of your problem at the top of the page. Take another deep breath and, as you do, start to access your inner voice. This can mean locating it in your body or engaging it in conversation. Maybe start by just saying "Hello." If you can't locate it or hear it, that's okay, just know that it is there and engage with it in whatever way feels most comfortable to you. Sit with this inner voice for a few minutes, just getting to know it. Where is it? What is it like? Do you hear it or feel it? Does it speak to you in pictures, words, feelings or impressions? Once you feel like you have a sense of your inner voice, return to the page and start writing a solution (or solutions) to your problem from the perspective of this inner voice. Write down everything that comes to you. Don't edit or sensor or judge. You are simply here to take dictation. Often what comes out first will be junk - "I can't do this." "This is ridiculous." "I am too busy for this." - whatever your negative mind thoughts, get them all out and then just let them go. Soon you should enter a space of non-thinking, of just intuiting. Write everything that comes to you. Get it all down. When you feel complete, stop writing and set your journal aside for the rest of the day. Tomorrow, or whenever you feel ready, read over what you have written and see how it feels to you. Did you come up with some good ideas? Do they seem a bit out there or very different from how you would normally approach a problem like this? Are they a bit scary and outside of your comfort zone? Take baby steps this week and start to try out your suggestions. How do things go? Better than usual or about the same? As you go about your life this week watch for signs that you are on the right track. You may hear a song, read a quote or run into someone, and be reminded of what you wrote. Let this be a sign that you are in the flow of your intuition and that you are on the right track. Have a great week. Please let me know how this works for you and don't hesitate to contact me if you have any questions. Labels: Intuition, Jane Austen, KNOWING, Write Your Life! Labels: Anodea Judith, BEING, Change, Manifesting the LIfe You Desire, Stillness, Write Your Life! Labels: BEING, Happiness, Leo Tolstoy, Manifesting the LIfe You Desire, Write Your Life! Labels: BEING, Manifesting the LIfe You Desire, Phillip Shepherd, Write Your Life! Labels: BEING, Manifesting the LIfe You Desire, Pico Iyer, Write Your Life! Starting next Monday I will be doing a month-long series of Write Your Life mini-sessions. Woah, that's a mouthful! So what does that even mean - "a month-long series of Write Your Life mini-sessions?" Starting May 9th I will be posting one exercise from my new book "Write Your Life!" on my blog every Monday, allowing you to get a taste of the book and to begin to write your life. How will that work, you ask? FIRST, sign up in the sidebar ---------------> to receive blog posts via email. That way you are sure to receive the exercise for the week every Monday. NEXT, join my Facebook Community - Being & Becoming - to receive daily inspiration and responses to your questions LIVE every Tuesday and Thursday between 10:00 and 2:00 PST (I may not be online the whole time, but will respond as soon as I can during that time frame). So grab a journal and your favorite pen and START a new life today, WRITE a new life today, WRITE YOUR LIFE! Please share this post with anyone you think would be interested. I would be most grateful!